cut down on both food shopping and food waste. normally chuck out, and give it a whirl as soup. 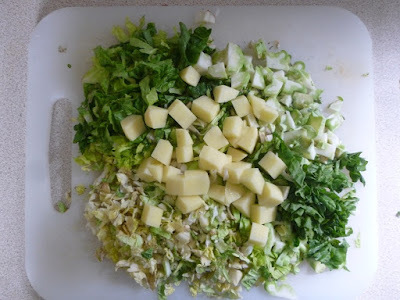 When I’d accumulated a decent amount, I chopped it up roughly, along with an onion, clove of garlic and a potato from a yellow-stickered bag. Chopping and then some more chopping. I heated the whole lot in a pan for a few minutes, so it softened slightly, then bunged in half a litre of chicken stock, made from the carcass of the massive chicken bought in Morrisons, and topped up with a litre of water. 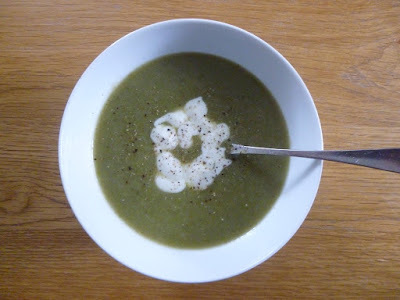 After boiling the contents for 20 minutes or so, I whizzed it up with a stick blender and ate some of the resulting soup for lunch, together with a soft cheese and ham sandwich. Leftover stalks and leaves soup, with black pepper and a swirl of natural yogurt. The glamour. Slightly to my surprise it tasted pretty good, even if I do say so myself. The soup was also very handy on Sunday evening, when I didn’t feel like cooking after making a big meal – and an actual pudding – at lunch time. My husband had several helpings, which is a definite vote of approval, and together we polished off the rest of the pan. 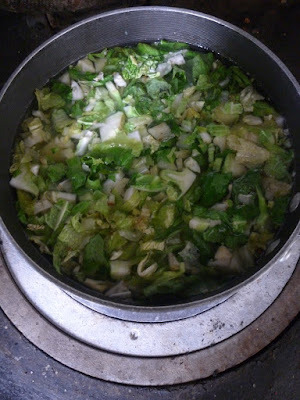 I reckon four or five bowls of soup therefore cost about 20p to cover the onion, potato and clove of garlic, given I would normally throw the rest of the ingredients away. Anyone else have favourite recipes for using up leftovers or conjuring something out of nothing? The 20p is based on the cost of a 160g potato from a Co-op yellow-stickered bag of Rooster potatoes at £1.25 for 1.7kg, a single onion from a 1kg pack at 55p from Aldi, and a clove garlic from Morrisons, 4 bulbs for £1.10. Like you I hang on to all the bits left over. 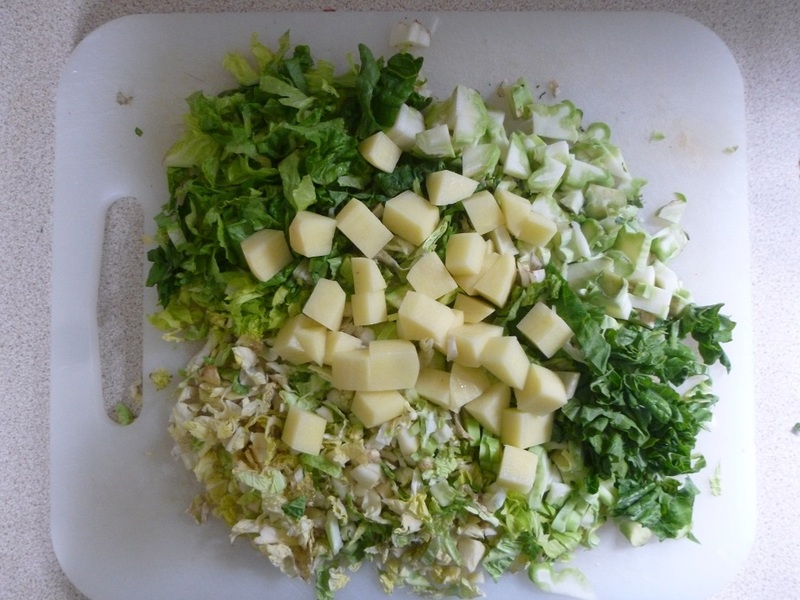 I sometimes make soup or a vegetable risotto for a more substantial meal with a little cheese grated on top ….delicious. We throw far too much away these days or do we buy too much in the first place? Veg risotto sounds a great use of leftovers, I must try that, not just the times when I put risotto on a meal plan. Suspect many of us buy too much AND throw too much away, know I've certainly been guilty of that. Doing Live Below the Line ialways makes me much more aware of food waste, and the need to avoid it. Our favourite soup is Christmas dinner soup, which we always have on boxing day with fresh bread. Every thing left in the serving bowls is blitz , gravy as well, add water until you have your desired type of soup, ours is normally a broth, season heat and serve. What a fantastic way of cutting down on cooking after surviving Christmas Day! Love the use it up soup! I have a similar recipe, but I noticed you have something that looks like cream in your soup – is that right? I think that's where mine could be improved – cream always makes soup taste better! Thanks Zoe1 Cream would be nice, but I actually used value range natural yogurt for this one. A pinch of chilli flakes while the soup is cooking can give it a good lift too.